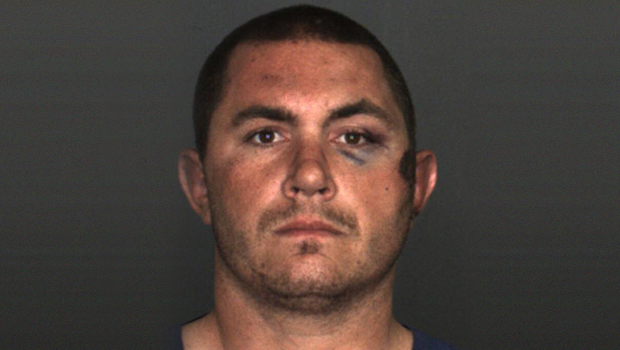 SAN BERNARDINO, Calif. - A Southern California man who was chased by sheriff's deputies while riding a horse -- and whose subsequent beating by those same deputies resulted in a $650,000 settlement -- was charged Thursday with resisting arrest and animal cruelty. Francis Pusok, 30, also was charged with reckless driving and being under the influence of a controlled substance. He is free on $100,000 bail pending a June 16 arraignment. During a 2 1/2-hour chase April 9, Pusok fled by car and then on a stolen horse in the desert in San Bernardino County while deputies chased him on foot. They were trying to serve a search warrant in an identity-theft investigation. Pusok's eventual arrest was recorded by a KNBC-TV news crew in a helicopter. The video showed Pusok, dressed in bright red clothing, falling from the horse as a deputy ran up and fired a Taser that officials said was ineffective. Pusok was face down with his legs outstretched and hands behind his back as a deputy threw punches and kicks. One deputy kicked him in the crotch. Other deputies arrived moments later. The video led to a federal civil rights investigation and County Sheriff John McMahon said the video "disturbed and troubled" him and appeared to show an excessive use of force. Ten deputies were placed on paid leave pending a departmental investigation. Last month, San Bernardino County supervisors approved paying $650,000 to Pusok to avoid a lawsuit over the beating. According to County Superior Court records, Pusok has a number of vehicle code violations in his history. He also pleaded no contest to several criminal charges in a prior case, including resisting arrest, attempted robbery, animal cruelty, and fighting or offensive words. Messages seeking comment from Pusok's lawyers about the new charges against him were not immediately returned.